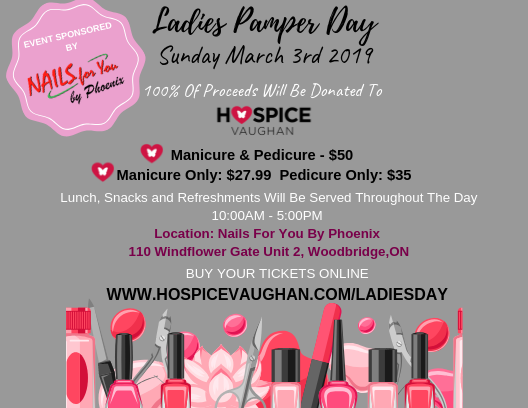 100% Proceeds Donated to Hospice Vaughan! To purchase your tickets to Ladies Day, please click the link below! Should you have any questions, please contact Diane Presta at diane@hospicevaughan.com or 905-850-6266 x 201. The Event will run all day between 10AM to 5PM – tickets includes lunch, snacks and refreshements! Diane Will be in contact closer to the event date to get your preferred time slot. Time Slots are flexible, it is just to give us a better idea on salon staff/food during those times.